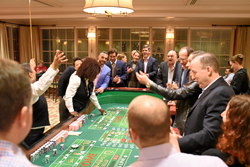 Eva’s Village, a Paterson, NJ anti-poverty nonprofit with twenty integrated programs to assist those in need, held their most successful Casino Night to date. It really was an incredible evening.... Eva’s village is an amazing place and offers multiple paths to escape the realities of poverty. The 4th annual Casino Night was held on March 4th from 6:30-10:30 pm at the Montclair Golf Club in West Orange. This event helped support the many anti-poverty programs at Eva’s Village, whose mission is to feed the hungry, shelter the homeless, treat the addicted, and provide medical and dental care to the poor with respect for the human dignity of each individual. Eva’s Village also provides childcare, after-school and a summer program for the children living there, as well as job training for the unemployed. The highlight of the evening was the story of recovery shared by an Eva’s Village alumnus. Success stories like his gives Eva’s Village good cause to celebrate and are the reason they work so hard to bring their founders, Msgr. Puma's, vision to life: to provide care for those in need with respect for each individual's dignity. Founded by Msgr. Vincent E. Puma in 1982 as a response to the poor and homeless in Paterson, NJ, Eva’s Village is a non-profit comprehensive social service organization with a mission to feed the hungry, shelter the homeless, treat the addicted and provide free medical and dental care to the poor. Through almost three decades of service, Eva’s Village has established a unique record in facing community challenges and changing the lives of the hungry, homeless and addicted. It has grown from a simple soup kitchen to become the most respected anti-poverty program in New Jersey. Eva’s Village now includes twenty integrated programs.